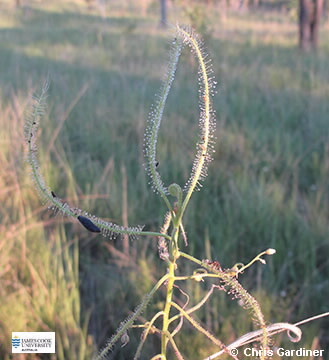 This small plant has narrow leaves to about 10 cm long, these are covered in glandular hairs which trap insects. The plant then digests them and absorbs the nutrients. Flowers are borne in a terminal raceme, corolla white or pink. Fruit a capsule. Plant found in moist areas, preferably on nutrient poor soils.